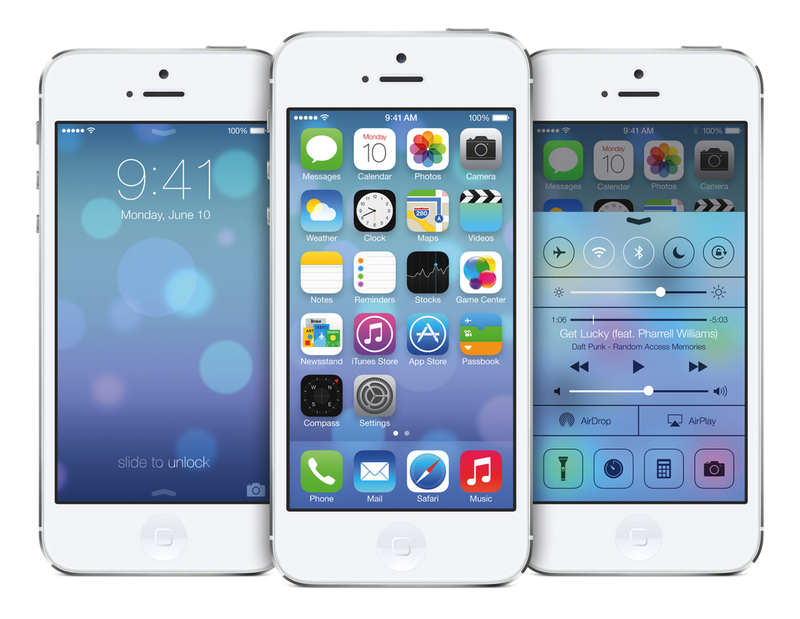 Announced yesterday at Apple’s WWDC 2013 keynote, iOS 7 is a dramatic reimagination of Apple’s mobile operating system. iOS 7 introduces new user features and brings over 1500 new developer APIs. For users looking for a quick overview of what’s changed and improved in iOS 7, the OS’ user interface will immediately appear as the most visible change. Tim Cook referred to it as a “stunning new UI”, noting how iOS 7 is the biggest change to iOS since the introduction of the original iPhone, which ran iPhone OS 1.0. iOS 7 is unmistakably different, but how the interface looks is simply the first aspect that jumps out. In the past months, there’s been a lot of talk about a “flat” redesign of iOS sperheaded by Jony Ive, now in charge of Apple’s Human Interface group. Before yesterday, the word “flat” had been thrown around to indicate a design direction inspired by Microsoft’s Metro: a design language with a focus on simpler shapes and typography, a clearer iconography, a wider use of whitespace and solid colors, and a broad acknowledgement of the importance of content, rather than interface elements like buttons, photorealistic backgrounds, or lists rendered inside “sheets” of content. The terminology Apple has chosen is different: by Apple’s parlance, iOS 7 is precise, sharp, coherent, simple, and efficient with a focus on clarity, vitality, motion, structure, color, context. Content is paramount; the interface defers control to the user, rather than claiming it. To quote Jony Ive, iOS finds “profound and enduring” beauty in simplicity, “a sense of purpose” in the way the interface takes a step back, reasseses its role, and comes forward again, subdued, neutral, more intimately “connected” to the hardware that lies underneath the OS. Yesterday, I thought the new iOS Home screen icons lacked a unifying vision. Stripes and glossiness have been replaced by simpler shapes and hues, but I found it hard to see a common thread in their design language. Game Center uses colored 3D bubbles on a white background; the digital Stores feature Apple’s typical blue and purple colors with a new gradient; Calendar and Clock icons reflect current day and time, respectively, but Weather doesn’t; Safari’s trademark compass icon has been simplified, but Settings’ gears look more “intricate”, from a visual perspective. I could see why Joshua Topolsky would call some of the icons childish and confusing, and why Jim would simply point out that there was something “odd” about them. The more I think about it, the more I keep coming to the conclusion that simply focusing on the icons misses the point. Apple is dedicating an entire webpage to iOS 7’s new design language, and a salient point that also transpired from Jony Ive’s video introduction was that iOS 7 hasn’t been designed just to look “beautiful” on a mere graphical level. Unnecessary bars and buttons have been removed. And in taking away design elements that don’t add value, suddenly there’s greater focus on what matters most: your content. This is an important distinction, especially in the light of aforementioned doubts on taste and changes to visuals we’re accustomed to. Apple is saying that they want the UI to play a supporting role; they want to stop “overpowering the content”. Instead, the team lead by Ive wants their “coherent” interface to be a means to an end, not the protagonist of the experience. iPhone 0S 1.0 was created by people and for people who couldn’t be completely sure mobile devices would revolutionize our lives. Apple couldn’t know that, six years later, there would be an App Store approaching 1 million apps and over 600 million iOS devices sold. As a consequence, the interface they shipped in 2007 had to be familiar, reassuring, potent in the way it had to teach users how to tap items, scroll a carousel, or flip pages in a book. The interface had to drive the content. In 2013, the landscape is completely different. While there will always be “first-time users” who are unfamiliar with the idea of tapping elements on a screen, at least 600 million of them know their way around iOS now. The motivation has changed: Apple isn’t asking how they can create a mobile OS that takes the user by the hand; they want to make iOS more delightful and simple without giving up on raw power and advanced technology. And for iOS 7, they have decided to bet on content and functionality instead of ornaments. This is a profound change with consequences that go beyond “how icons look”. What I found most interesting is the way the new design language is allowing Apple to build an entirely new structure for the OS. Later, users wanted multitasking and folders. Unsurprisingly, Apple gave them implementations of these features that look like objects, in this case objects with linen. Here’s where the situation gets more complex: folders and the multitasking tray, unlike app icons, actively interact with the Home screen, they don’t just sit on top of it. The way Apple designed them, the multitasking tray resides as linen below the Home screen, and folders are tiny containers with a linen background that expands atop of the Home screen. You can see how the entire concept of Home screen as a surface starts crackling under the design weight of these features: is the Home screen a surface that has another layer underneath? Another one above as well? What do you mean I have music controls in the multitasking tray, too? As Gruber also notes, for all the talk about a “flat” design style, iOS 7 has a clearly defined 3D architecture that is a good example of how software and hardware can work together to create a more “vital” experience that feels “human” (both adjectives have been used by Apple). Notably, iOS 7 comes with an all-new parallax effect for the Home screen, which enables icons and other GUI elements to “follow your eyes” as you tilt a device. Making characters and game content feel like an extension of the player has long been a priority of Nintendo. In the old iOS, holding and tilting an iPhone reminded me that there was software “inside” the screen, much like letters are fixed and indivisible from paper they’re printed on. With iOS 7, parallax is subtle, but it makes me feel like I’m using a device where hardware and software are cooperating. Parallax effects haven’t been enabled everywhere in the OS yet, and I’m looking forward to understanding whether developers will have APIs to implement them in their apps. In practice, parallax was described as being able to see behind the icons while using a photo of your family as wallpaper. Simple and human. Then there is translucency. In iPhone OS 1.0 and up until iOS 6, Apple used solid and glossy bars and controls, with the occasional transparency effect that, in the end, tended to feel like a gimmick and not a core part of the experience. In iOS 7, essentially every element that is layered on top of others is translucent, so that you’ll be able to get a hint of what’s underneath. In the process of considering translucency as a catalyst for context and “giving a sense of place” to the user, Apple has taken apart the layers that iOS accumulated over the years and rebuilt them from the ground up while adding new user features. Notification Center is still there, still accessible with a vertical swipe from the top, and now also available from the Lock screen. The infamous linen texture is gone, and the interface is now translucent – it blurs the background just so slightly to make text and icons look clear while also reminding you what you were doing before opening Notification Center. If you were on the Home screen, you’ll see blurred versions of the app icons; if you were viewing a photo on a website with Safari, you’ll see the webpage in the background. Another great example of translucency is this Messages demo provided by Apple. Because the system keyboard, slightly redesigned in iOS 7, can hint at content below, sending a message in a long conversation shows a blue bubble rising from the bottom of the screen, and blurred underneath the keyboard until it reaches the main content area, where it’s shown as a solid blue chat bubble. Transparency is also used profusely in iOS 7’s new title and status bars, which, at least in the majority of Apple apps seen so far, tend to blend in a single white translucent area at the top of the screen (the same happens with tab bars at the bottom). As demoed yesterday on stage, the same system is the foundation of the new Home screen folders as well, which are now displayed as transparent, paginated overlays. The third aspect of the iOS 7 structure is motion. iOS 7 comes with new animations and gestures based on the principle that motion should convey information. In the new Home screen, tapping an icon doesn’t simply bring up an app – iOS “zooms” into an icon to get to the fullscreen app view. The same happens when you close an app with the Home button – the system zooms out and you’re back to the Home screen. The new multitasking system of iOS 7 is the exemplification of iOS 7’s structure and motion. The multitasking tray is gone, leaving room for a (Pre-like) swipeable gallery of recently used apps that doesn’t reside in a linen area below or above the Home screen, but simply exists. As you double-click to switch between apps, the current app zooms out, and you’re presented with a horizontal list of app icons and previews of how you left them; the Home screen is always to the leftmost side of the switcher. You can scroll to view apps, then tap icons or screens to switch back with another “zoom in” animation. It’s too early to tell, but my impression so far is that motion, animations, and updated transitions will be core tenets of a more cohesive iOS app-switching experience. I was more concerned about iOS’ functionality than its looks. While Apple didn’t grant some of my iOS 7 wishes, I liked a lot of what I saw yesterday. Notification Center has been enhanced with three separate tabs for Today, All, and Missed notifications. All and Missed are rather self-explanatory, and the OS still comes with the usual settings to tweak notification behavior and display by time and name; notifications are grouped by app, now synced across devices, but you’ll still have to dismiss them through a single “Clear” button (that, however, seems to be larger and more comfortable to tap than in iOS 6). The Today view is intriguing: it provides a summary of each day and a sneak peek of “tomorrow” by plugging into Reminders, Calendar, Weather, and Stocks and pulling relevant information such as weather conditions, upcoming appointments and todos. It doesn’t seem to be reaching the same level of flexibility of Google Now, but it should be a welcome addition to turn Notification Center into more than just a container for missed updates. I am curious to find out if third-party apps can plug into the Today view: imagine being able to see your OmniFocus or Evernote reminders in there. At the opposite side of Notification Center there’s the new Control Center of iOS 7. Available with a swipe from the bottom and using the same translucency and new drag handle of Notification Center, Control Center comprises parts of the old multitasking tray and long-requested shortcuts to enable and disable oft-used hardware features. It is organized in five sections: at the top, toggles for Airplane Mode, WiFi, Bluetooth, Do Not Disturb, and Orientation Lock, plus a Brightness slider; in the middle, playback controls for currently playing audio; and at the bottom, AirDrop settings (more on this below), and shortcuts for four system apps: Clock, Calculator, Camera, and a new Flashlight. I find the design of Control Center to be extremely thoughtful. The icons it contains are depicted as outlines, something that reminds me of blueprints and manuals – which would be a smart resemblance considering Control Center’s purpose. While many are complaining about Control Center’s overcrowded layout full of options, I believe that the Control Center section in the Settings will be getting more options as iOS 7’s development cycle progresses. I rarely tweak my system’s brightness, and I’d like to change the calculator and clock shortcuts to something else. Overall, I have no doubt that I will come to rely on Control Center’s buttons to disable WiFi and Bluetooth, something that required several taps in iOS 6 and that is now a single swipe away. AirDrop is not a surprise, but it’s certainly welcome. Available in Control Center and any app that supports the system Share Sheet, AirDrop will allow you to share files with users near you without having to bump phones, send an email or a message, or upload a file to Dropbox and then generate a public link. Using WiFi/Bluetooth and encrypted communications between devices, AirDrop displays available users as circle avatars in the Share Sheet; in Control Center, you can make yourself discoverable for AirDrop to everyone, or only people already in your contacts (this contact check is, I believe, the reason why AirDrop requires an iCloud account). AirDrop is only available for the iPhone 5, 4th generation iPad, 5th generation iPod touch, and iPad mini. Apple says that, after accepting an AirDrop sharing request, content is “saved right where it should be”, so that a pass is sent to Passbook, a photo is sent to Photos, and so forth. I think this is a good default implementation, but I do wonder how third-party apps will fit with this system. Will third-party apps like, for instance, Skitch be able to send a file directly to another version of Skitch if it’s also installed on the recipient’s end? Or will Apple once again resort to “Open In” (and therefore duplicates) to let users who receive a file/data via AirDrop send it somewhere else? Borrowing from Newsstand’s automatic background downloads, Apple could offer an API to let third-party apps request a periodic, automatic download of data. To avoid issues with battery life and 3G data plans – which have always been a concern for me – iOS 7 could regulate background downloads by checking a device’s battery life, 3G allowance, CPU usage, connection quality, location, and usage frequency of each app. Are you around town with poor 3G, 20% of battery left, and an app you haven’t used in 3 weeks is requesting a background download? You likely won’t need that. But what if you’re at home, on WiFi, and OmniFocus, which you use daily, wants to get the latest todos from its online database? iOS 7 could enable a background download for it. And, essentially, this is what Apple is doing with iOS 7. They call it “multitasking for all apps with great battery life”, and it’s aimed at providing a better app switching experience by ensuring content (such as a news feed in Facebook, tweets in a Twitter client, or articles in a news app) has already been fetched before the user opens an app. iOS 7 employs various techniques to update content in the background intelligently. Firstly, it notices patterns of use and remembers when you tend to open an app during the day. So if you usually open Facebook in the morning and Tweetbot every hour, it’ll try to remember those patterns and save them as a first data point for background updates. Second, iOS 7 will always try to update apps in the background when you have good network coverage, sufficient battery life, when you wake the device, and it’ll try to do multiple apps together in order to avoid separate background updates. Last, it’ll try to use push notifications as triggers: in practice, this should mean that if you use Tweetbot a lot, you should always be able to open the app and find tweets waiting for you, and when you receive a push notification for a new DM that message will be fetched in the background so that you won’t have to reload the DM view again when you’ll launch Tweetbot. In my iOS 7 article, I mentioned how giving more backgrounding options to developers could result in some apps abusing the system, and my understanding is that Apple has (unsurprisingly) gone in the opposite direction: a series of checks, patterns, and data points that are ultimately analyzed and deemed as “okay for background” by iOS, not third-party developers. Alongside improvements, I also wish Apple can find a way to tell users that they don’t need to manually quit their apps. I see this kind of behavior every day, and I can’t imagine how frustrating it can be for those people to think they have to close their apps like on a computer. With iOS 7, Apple is actually providing a clear explanation of how apps can be quit when not in use, and I wonder if this is a necessary consequence for trying to find ways to preserve as much battery life as possible. I may be wrong – and obviously I couldn’t test any app that is using the new background refresh options – but I find Apple’s multiple mentions of the new gesture to quit apps curious. My fear is that this new system will reinforce many users’ belief that apps need to be managed in their running and suspended states, which I don’t think is exactly a pleasant experience, especially when you’re dealing with several apps every day. The new background refresh technologies, overall, sound like what I was wishing for, and I look forward to seeing how iOS 7 will handle them with my favorite apps. Siri didn’t get an API (and we’ll have to wait for iOS 7’s final release to judge reliability and improvements to international language recognition), but Apple did announce a new look for it as well as new integrations with third-party services. To overcome Siri’s limitation in regard to real-time feedback (something that Google does right), Apple has now given Siri – which has the same translucent look of Notification Center and Control Center – a new sound wave animation to indicate that it’s listening and elaborating requests. The sound wave doesn’t provide the same kind of “wow, it’s transcribing my voice in real time” effect that Google has, but I believe it’s a good improvement. Unfortunately, we didn’t see any sort of textual Siri, either. In an ongoing tradition that sees the company choosing other companies over Google, iOS 7 Siri comes with inline web search results powered by Bing. Microsoft must be satisfied, but we’ll have to see whether Siri’s choice and Bing’s quality of results will turn out to be better options than launching a regular Google search in Safari. I’m more optimistic about Siri’s two new data providers, Wikipedia and Twitter. The latter will be useful to quickly check on what a person is saying on Twitter by asking Siri to fetch his/her latest tweets; Wikipedia should be a fantastic addition to check on common, every day questions that are too plebeian for WolframAlpha. Siri will also be integrated with “iOS in the car”, a new initiative coming in 2014 that will see iOS working with new car in-dash systems for listening to music, making phone calls, checking on Maps directions, and replying to Messages. Unfortunately, I don’t have many thoughts on this as I don’t own a fancy car with a configurable display. Camera and Photos received updates that I both care and don’t care about – but I recognize how millions of other users will. The Camera received filters and a new square view: I am indifferent to these features, but I imagine that they will be popular among heavy Facebook and Instagram users. I welcome the new Camera view, which, despite the addition of functionalities, feels simpler thanks to a swipeable interface to switch between camera modes (plus HDR and grid options that aren’t hidden under a toggle). Apple finally understood that better photo organization was needed, and they revamped the Photos app with new views for browsing photos. Using metadata that iOS automatically attaches to each photo, items are organized in Years, which are organized in Collections (Location + Date and Time), which are further divided in Moments (again, location + date and time for single days). It is an obvious, but still smart way of organizing photos, and it integrates well with Maps to view the exact locations where photos were taken. It will be especially useful for trips and for having a “daily log” of sorts – I am already wondering if apps like Day One could somehow access the UI and data exposed by the Photos app. For Photo Stream users, the ability to see an Activity view and let others contribute to a shared Photo Stream should be a solid addition. I had big hopes for the App Store, particularly for search and discovery, but Apple announced features that I wasn’t expecting. The big addition is “Near Me”, a new tab that shows a “curated collection” of apps that are popular in your location. Federighi used the word “curated” yesterday, so it’s unclear if Near Me locations will be managed by the App Store editorial team, or if an algorithm will help in discovering apps that are being used (or installed?) near popular locations. Furthermore, Near Me replaces Genius in the App Store’s tab bar, which is suspiciously absent from screenshots posted on the iOS 7 website. Both Near Me and Top Charts mark, so far, a return to vertical lists instead of cards or horizontal galleries. With a new John McCain mode, Apple is now allowing the App Store to automatically update apps on behalf of the user. This fits well with iOS 7’s extended focus on background features, and Apple says that another benefit will be the removal of the “little red badge begging for your attention”. For parents, Apple will launch a new Kids category collecting apps organized by age ranges. I am still looking forward to improvements in search and discovery that don’t involve tracking the user’s location to surface apps, and I wouldn’t be surprised to see the behavior of the iOS 7 App Store changing several times throughout the summer. I am moderately intrigued by the new features in Safari. As I wished, the browser received a better way to access Private Browsing mode and a new interface that doesn’t force you open a maximum of 8 tabs anymore, and now lets you swipe them away (similarly to Chrome for iOS) to close them. Like Mountain Lion, iOS 7’s Safari has received support for a new back/forward gesture (one that Apple is using in several apps in iOS 7), and, like Mavericks, a new unified view for bookmarks, Reading List, and Shared Links from Twitter. My favorite feature of the new Safari is the unified smart search field that lets you type URLs, searches, and bookmark names without making you switch between two different locations. For my workflow, this should make for a better experience in launching bookmarklets and Google searches – which I do very often. As for iCloud Keychain – a new functionality to sync sensitive data across devices that Apple first demoed with Mavericks – I think that it’s a welcome improvement, but, as a 1Password user, I don’t know if it will be enough for me to switch, and, based on what we’ve seen so far, its lack of a visible app/database where I can go and copy passwords every time I need them makes me skeptical. iCloud Keychain sounds like a Safari feature, whereas 1Password is an app available anywhere. There are hundreds of other features in iOS 7 that can be read on Apple’s website, The Wirecutter’s “In Brief” roundup, or spotted in some of the slides shown on stage. iTunes Radio, built into the Music app, will provide a free, ad-supported Pandora-like experience to listen to stations curated by Apple or created by you, with one-tap purchase from the iTunes Store. Find My iPhone is getting some powerful new functionalities to prevent damage to your content and online identity for lost devices. The Weather app is being reimagined with beautiful imagery and animations for weather conditions (somewhat reminiscent of Magical Weather). There are thousands of new developer APIs that will expose new areas of the operating system to app makers, enabling them to create more powerful, flexible apps that will solve new problems in new ways with new technologies. I didn’t want to rush my coverage of iOS 7, and, even several hours after the keynote, I’m still processing the news and trying to consider all the possible implications of what Apple is trying to accomplish. With such a profound reimagination of iOS, I think it will take me weeks to form a final opinion and understand all the subtleties, all the complexities behind the new iOS. Today, I believe that using the Home screen icons as the metric to debate whether Apple has “lost its way” addresses the problem from the wrong end. Yes, several icons stand out to me as odd. Yes, I am asking myself if some design choices were dictated by trends or if everything about iOS 7 is seen by Jony Ive as genuinely timeless. I am watching and reading people’s reactions to the Home screen – admittedly, the first place users see and the one they always go back to – and I agree that polarizing does indeed sum up iOS 7 so far. iOS 7 is highly opinionated software, and it shocks us because it’s a radical departure from graphical styles and guidelines we were familiar with after 6 years. On one hand, I believe Apple has time to tweak icons before the Fall; on the other, their choices are intentional, planned. In the end, though, there’s so much more to iOS 7 than its icons. iOS 7 has a new focus on content with an interface that emphasizes hierarchy, context, edge-to-edge designs, gestures, motion, and typography. I don’t think that iOS 7 has lost its predecessors’ playfulness; in fact, I do believe it’s got a different kind of whimsy – one that is related to content and information, not just the resemblance of toolbars to leather or paper. I already see this in the animations and transitions for moving between views, the way Control Center comes up from the bottom of the screen, or how tapping an icon zooms into it, bringing an app in the foreground. I don’t know if third-party developers will follow Apple’s example and update their apps to mimic Apple’s styles and app architectures. The iOS platform has distinguished itself for the richness and variety of its app ecosystem, with third-party apps that make delightful use of custom graphics and layouts, employing their own set of animations and user interactions. Five years ago, when Apple launched the App Store, developers initially looked up to Apple as a guide on how to style and present an iPhone app; in 2010, when the iPad was released, the first wave of third-party apps focused on an experience familiar with Apple’s system apps – there were hundreds of apps that used Mail’s layout or Pages’ document navigation. Both with the iPhone and iPad, however, it took developers just a few months to keep studying the platform and their users to come up with fresh, original app ideas and designs while still respecting iOS’ guidelines and underlying principles. That’s how we got apps like Flipboard, Brichter’s Twitter for iPad, Evernote 5, Instagram, and hundreds of others. iOS 7 comes at an interesting time: users are now familiar with the idea of apps having their own personalities and designs, but developers have only 3–4 months to make sure their existing apps will fit with iOS’ renewed coherence and architecture. Will we see a repetition of 2008 and 2010, with developers following “Apple’s example” in the short term and experimenting with more audacious designs in the future? Or have the past five years of App Store given developers enough confidence to start considering custom iOS 7 app designs right away? Will we see fewer use of textures and buttons in third-party apps, with simpler iconography and more importance given to perspective, animations, physics, and transparency? I think it’s both an exciting and scary time to be an iOS developer. I have many questions, and I don’t know who will answer them, or when. But among all my doubts and uncertainties, what I keep thinking about is: has Ive managed to fully realize his vision in seven months? And that is, I believe, why Apple said that iOS 7 isn’t simply change, it’s a new beginning. It’s not an understatement: iOS 7 is not about the icons, labels as buttons, translucency, questionable Lock screen gestures, or a new Spotlight as design choices taken individually – it’s about a single, precise idea: to make iOS simpler and more enjoyable, but at the same time more useful. Control Center, multitasking APIs and background refresh, the new Calendar and Safari, AirDrop and Siri, iBeacons and Sprite Kit for developers – these are all features aimed at making iOS simultaneously familiar and future-proof. After a day of iOS 7, there’s a lot of confusion, lingering questions, inconsistencies that Apple will fix, and choices that are here to stay. I am still processing the news, reading, trying to understand and consider the changes that will come later this year. But there’s one thing I’m sure of: to paraphrase yesterday’s demo, we should look beyond the icons. iOS 7 will be defined by its overall design language, user features, and developer technologies. In many ways, this is version 1.0 of an OS for the next five years.